If you watched the Super Bowl last month, you saw a team throw a pass to their quarterback on fourth down for a touchdown. What a gutsy call. The thing most people probably missed about that play is that it wasn’t an improvisation. They had practiced it for weeks leading up to this game. The other interesting thing is that their opponents tried almost the identical play earlier in the game. Was it a coincidence? I think not. Winning teams in all sports are always looking for ways to catch the other team off guard. For years the Patriots have found ways to undermine the other teams preparation with innovation. Teams prepare for what the Patriots did last week and they do something completely different this week. I believe it’s the main reason for their success. They’re not constrained by convention. They take a college quarterback and make him a great wide receiver. They take a college lacrosse player and make him a great offensive weapon. Other teams (like my Jets) seem afraid to take calculated risks and would rather play “percentage football.” The same is so true in doubles for adult, competitive players. I’m always amused when a doubles team goes outside the box for their game plan and they get criticized by their opponents for not playing “real tennis” or “good tennis.” There are so many ways to be successful at this level that go against traditional thought. Unfortunately players and coaches just keep repeating the same worn out (and ineffective) mantras instead of catching the opponents off guard and using tactics that they’ve never practiced against. Here’s an anecdote from my high school tennis coaching days that will clarify this point. Back in the 1980’s we were one of the best teams in the state and we were playing another state power in a non-conference match. In those days there was no coaching your players unless they split sets so they had to be very prepared for whatever their opponents would throw at them. On this day the other team came out and played Australian ( old school Australian, not I formation) the entire match. Our kids were immediately flustered and couldn’t get themselves calm enough to figure out what was happening and how to combat it. They lost their cool and we lost all three doubles matches and the overall match. That day I vowed to make sure our kids were ready for anything and would try to disrupt our opponents instead of waiting for them to disrupt us. When Matt Previdi was in middle school, I was the basketball coach at his school. We played a team that had kids that were the size of high school players and they ran all over us to the tune of 35 and 40 point wins. I was tired of feeling so helpless and watching our kids get run over so I asked a friend who is a high school coach a question. If there is no shot clock, what would stop us from holding the ball and never shooting? Losing 2-0 is better than getting your heads beat in. He said nothing except the fact that everyone (including your own teams parents) would hate you. It was a risk I was willing to take. Long story short, we lost by 4. Most surprising is that our players parents completely lost the lesson their kids learned that day. They were angry we didn’t play “real basketball” and get our heads beat in again. So how does this relate to your doubles matches? There are some simple strategies that you should be devoting practice time to so you can disrupt your opponents, get them off balance and undermine their confidence and comfort. Here are some opportunities for you, but only use them if you want to win. Have you ever tried lobbing every return of serve? What do you think would happen if you did? I will tell you.You would win! Within the first few games your opponents would lose their minds! They have never prepared for this type of game and any adjustments they might try to make (playing both at the baseline for example) will undermine everything they’ve ever worked on and are comfortable with. Most of the players you play against have mediocre first serves and weak second serves. Why don’t you step up (inside the blue line on courts with the junior lines) and hit the ball as hard as you can at the net player? Believe me, we practice this and the opponents absolutely hate it! If your answer is “ I don’t want to hit someone,” you should probably consider taking up knitting or something safe. You’re not trying to hit anyone (and you’re not accurate enough to anyway), you’re taking advantage of a situation that is in your favor. One day in practice only hit returns to the net players side; no crosscourt returns. If you can hit it hard hit it at the net player. If not or for a change of pace, lob it. Do you know what will happen? You will win! Both of those returns go against everything your opponents have prepared for, they give you an advantage and will destroy them tactically, psychologically and emotionally, which is how the Patriots do it. One day in practice when your team is serving, have the net player poach everytime you’re ahead in the game. How does it affect the opponents? Is it something we could utilize in a match? We’ll never know until we practice it. Although I’m not a big proponent of Australian for adult players (for several reasons), I think you should practice it enough so that if you needed it in a match, you could use it with confidence. Practice “plays” when you are practicing don’t just hit random shots. If I return “here”, we both get to our positions and we know instinctively where the next shot goes because we’ve practiced this scenario a million times. We don’t need a million plays, just three that we’re great at. Take turns with your practice players being the disrupters. This will help both teams to be able to handle whatever is thrown at them. As we always say at our seminars, “ the strategy for tennis players regarding disruptors is to pray it doesn’t happen!” If you’re not ready for whatever is thrown at you, you should fire your coach. It’s their job to prepare you to be successful and to be ready for anything, not to do a lot of meaningless fed ball drills and work on things that rarely happen. Just remember, the average point in doubles lasts fewer than four shots- total! You need to be practicing serve and return all the time and you need to be great at positioning, shot selection and consistency for the second shot in all situations. 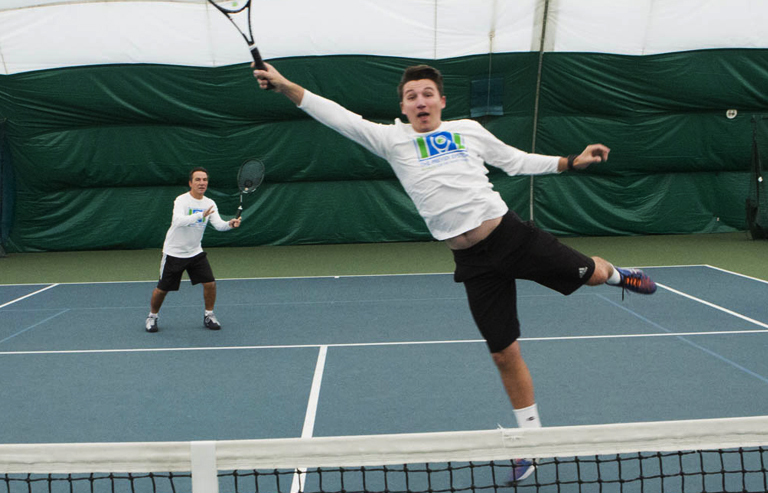 Do this and learn to be disruptive and we guarantee you will be a successful doubles team at any level! You’ve probably figured out by now that at The Previdi System, we are passionate about doubles and we’re passionate about adult, competitive players. We’ve devoted most of our careers to creating a system that will help these players achieve sustained success and we’ve packaged it in a way that they can teach themselves. In the coming months we will be offering a program that will help you to implement our system in your game. It will be connected to videos that explain the drills and games you need to do to be great at doubles. It’s the only program of its kind in the tennis industry and we’re proud to share it with all of you. Stay tuned. In the meantime, fire your coach and start training yourselves to be great doubles players using The Previdi System! Note*- Everything we teach in The Previdi System has been tested and retested by us and our students for years. This is not theoretical coaching (which most internet coaching is), this is application coaching. We continue to refine our system every day as players and coaches to make it better for you, our students! Update* - At practice this morning we were discussing a match that one of my great players had last week at 4.0. She and her partner lost the first set 6-0. Her thought process at that point was, “We’re not going to lose this match. We’ll figure out a way.” She literally started hitting all of her returns at the net player. She also lobbed a ton on second serve returns. The result was a win in the third set tiebreak. She said that within a few games of using the new tactics, the other team was at each other’s throats and losing their minds! They were completely unprepared for anything out of their comfort zone and couldn’t cope.It wasn’t only the tactics that won the match, it was her mindset. Find a way! Compete and stay committed! We don’t just see this at 4.0, we see this at 4.5 and in tournaments. We even see it at the national level. If you want to be successful, learn to be disruptive and learn to handle disruption!